Eucalyptus trees are a fast-growing tree that is found in tropical and sub-tropical climates. The timber is resilient and very durable with age, and has been used in many different ways throughout the centuries. The wood is very good building material and it burns well. The oil from the tree has been used as an antiseptic and to cure tuberculosis, bronchitis and croup. The scientific name is Eucalyptus globules. Eu is Greek for well, and calyptop means cover. This refers to the membrane covering that comes over top of the flower buds when they are developing. The tree is also called the Gum tree, reminiscent of the children’s song about a kookaburra. It is also known as the stringy bark tree. The origin of the Eucalyptus is in Australia, where it is a food source for the Kuala bear. It migrated to Africa, India and Southern Europe, but the most popular place for the Eucalyptus in the United States is in the state of California, where it is often considered a native tree. 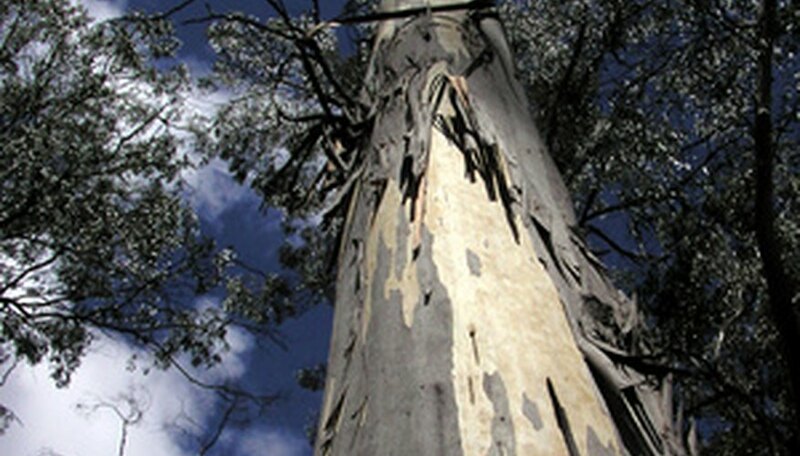 Eucalyptus trees have long trunks that may grow to 60 feet high or more. The leathery leaves hang from the tree vertically from branches and have a pleasant antiseptic scent. The flower buds are covered with membrane that breaks off as the fuzzy flower blooms. The tree secretes a sticky gum-like substance that is a protection from pests. Aberl Janszoon Tasman was the first to record the existence of the tree in 1642 in Tasmania. Here, the trees grew large enough to be noticed and documented, and the gum secretions were of interest. Other explorers also documented the tree and some began to collect the gum and seeds for research. They included William Dampier in 1688 and Captain James Cook in 1770. Sir Joseph Banks brought seeds and gum to England and promptly put them away and never touched them. A botanist from France, Charles Louis L’Heritier de Brutelle, took them and gave the tree its scientific name. In 1868, Ferdinand von Mueller, a botanist called the "Prophet of the Eucalyptus," declared future uses for the tree. He anticipated using the tree to prevent erosion and to make air healthier for humans to breath. He wrote 10 volumes about the tree. Early settlers had cut down most of the trees in California when building cities and towns. Australians coming to California during the gold rush in the mid 1800s were credited for bringing seeds of the tree with them. However, those who recognized the fact that the tree grew big and fast were probably responsible for starting groves that would produce badly needed wood. W.C. Walker may have planted the first Eucalyptus in San Francisco in 1853, according to the San Diego Union Tribune. Regardless, trying to produce lumber failed miserably, since the new wood in California twisted and splintered unlike the old wood in Australia. Left untouched, Eucalyptus trees grew huge, and in the 1950s they were found to make great fiberboard and paper pulp. In the 1980s, Eucalyptus tested to be sufficient for biomass fuel. Today, the trees brought to California are massive and would make an Australian jealous. Deborah Harding has been writing for over nine years. Beginning with cooking and gardening magazines, Harding then produced a gardening and cooking newsletter and website called Prymethyme Herbs in 1998. Published books include "Kidstuff" and "Green Guide to Herb Gardening." She has a Bachelor of Music from Youngstown State University and sings professionally. What Is the Origin of Mimosa Trees?